Fondue seems to be a food style that drops in and out of popularity. A chain restaurant in the United States does a brisk business serving fondue dishes at a hefty price. Fondue used to be a popular dish for dinner parties in the '50s, '60s, and '70s. As the saying goes, "everything old is new again," and sales of fondue pots are booming, no doubt riding on a nostalgia wave. Isn't it time you hauled out that old fondue pot? Or, try it at home for the first time. 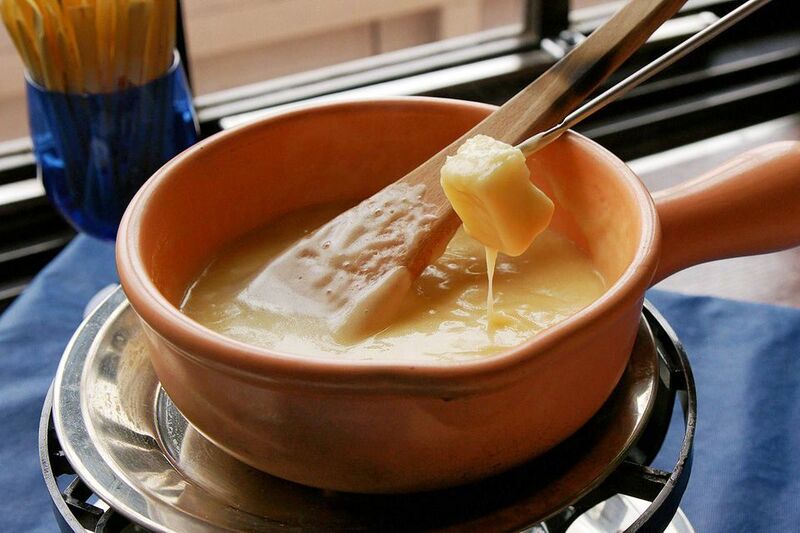 The addition of alcohol to fondues lowers the boiling point so that cheese proteins will not curdle, but take care not to boil it. Heat cheese mixtures slowly so the cheese does not become rubbery. When multiplying fondue recipes for larger crowds, remember there is less surface area to evaporate liquids, so you will not need as much as double the liquid of the original recipe. Sparkling cider, juice, or champagne may be substituted for white wine in fondue recipes. Use a good quality cheese in cheese fondues. Fresh herbs, sauteed minced onions, tomato paste, and mustard are all excellent flavorings for cheese fondues. For fondue that is too thick, increase the heat, add a little wine, and stir vigorously. For fondue that is too thin, combine 1/2 teaspoon of flour or cornstarch with an equal amount of wine. Stir into fondue until thickened. Metal pots are better for oil-fried fondues or hot-pots, while ceramic is good for cheese and chocolate. A Crock-Pot may be used to keep cooked fondue warm. Wine or hot black tea are recommended accompanying beverages for fondue. Some diners claim that drinking water with fondue makes the cheese congeal in the stomach causing digestion problems. Leftover fondue may be used as a topping for potatoes, vegetables, or eggs.